This late into the season, there aren't really any more flukes. Injuries are really the one major variable that can still change a team's fortunes, but it's impossible to know when landscape-changing losses like Aaron Rodgers will happen. So if we (mostly) accept the data that 10 weeks have shown us, the teams in the top and bottom 10 are likely to stay that way. Looking at the rankings from this time last year, eight of the top-10 teams remained there at the end of the season, and eight of the bottom-10 stayed near the basement. The middle is still terribly ambiguous, and it's probably best to wait for a few more returns before making any more definitive evaluations. The last couple weeks have seen me make some pretty foolish-looking predictions about these teams (more on that soon), so we'll step aside from the middle class for a week. Instead, let's take a look at arguably the biggest surprises from the top and bottom third, and try to explain how they got there. I've attempted to ignore the Eagles all season, mostly because their record never matched their lofty ranking. At first glance, it seemed simple enough to dismiss their constant top-10 status as a product of an uber-efficient offense. And yet, when Nick Foles throws 10 touchdowns over two weeks, that alone demands some attention. Indeed, there's a common misconception that Chip Kelly's offense demands a mobile quarterback. 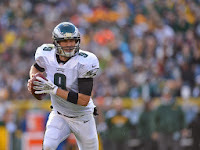 Mobility certainly helps, but its breakneck pace is really predicated on fast reads and decisions, something that has never been Michael Vick's strength. Individually, Foles' brilliant plus-32.5 EPA day against the Raiders was effectively cancelled out by his minus-11.1 performance in his prior start against the Cowboys. Otherwise, he has typically been around a plus-15 EPA, with about a 55 percent success rate. That would seem to imply that with even slightly above-average quarterback production, the Eagles offense as a unit churns out elite production. That good-offense-bad-defense quadrant is a perfectly acceptable one to be in—of the 11 teams, nine are in serious playoff contention. The Eagles have a three-game homestand coming up, so now would be a good time to snap that bizarre 10-game home losing streak and take advantage of a reeling Cowboys squad. The Atlanta Falcons were a trendy Super Bowl pick before the season, but injuries and under-performance have turned the NFC's top seed of 2012 into a 2-7 disaster. While the Falcons have certainly had some bad breaks, this isn't exactly totally out of nowhere. When Kansas City started 8-0 this year, Andrew Carroll wrote a post speculating as to whether they were the worst 8-0 team of all time. 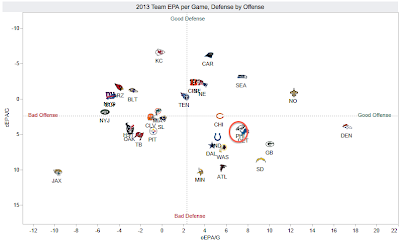 Based on Pythagorean wins, the Chiefs were a middle-of-the-pack team, but near the bottom of that pack? The 2012 Falcons, who went 13-3, actually had a final Pythagorean win expectancy of about 11 wins. Even without Julio Jones and with Roddy White struggling through a season-long ankle injury, the Falcons offensive production is still solid. A year after ranking ninth in total EPA per play and third in pass EPA per play, the Falcons have actually risen to eighth in the former category, and still sit a very respectable ninth. In terms of efficiency, the Falcons rank 11th in the passing game. And Matt Ryan ranks eighth among quarterbacks in EPA per play, even with three rough weeks in a row. It's really the rest of the team that's fallen apart. The Atlanta defense was really a house of cards last season, getting by with a defense that forced the sixth-most turnovers in the league. 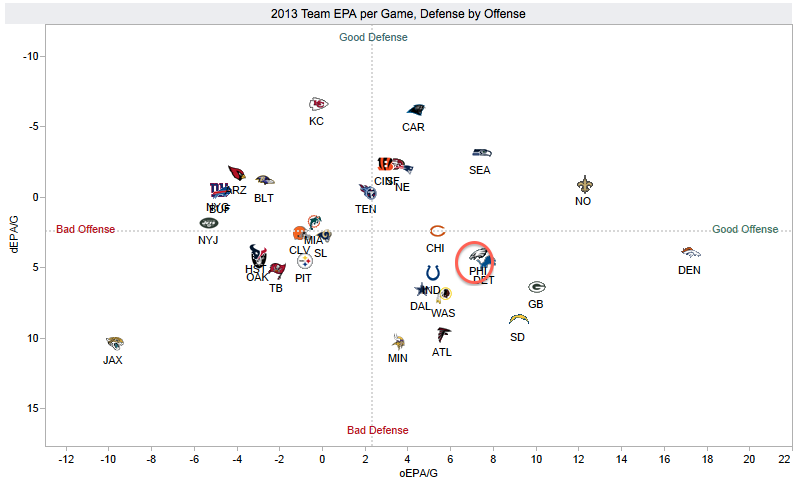 They're down to 27th in that department in 2013, leading to the fifth-least efficient pass defense this season. A lot of that is personnel-related. Atlanta lost its only plus-pass rusher from 2012 in John Abraham to free agency, and front seven starters Kroy Biermann and Sean Witherspoon went on IR early in the year. Their replacements have fared poorly, with Akeem Dent and Paul Worrilow being borderline unplayable at times. In the secondary, the Falcons have gotten an encouraging rookie season from Desmond Trufant, but starting safeties William Moore and Thomas DeCoud probably would not start for the majority of NFL teams, and veteran Asante Samuel has missed time with injuries. Atlanta, who was due for some regression, is not as bad as their record indicates, and next year should see some movement back towards the mean. They'll likely have better injury luck, and that 2-4 record in one-score games should improve as well. Ironically, coming into the year, the Falcons had the fourth-best winning percentage in one-score games since the Ryan era began in 2007. The Falcons badly need an infusion of depth this offseason, particularly on defense. But even the law of averages should bring them back to about a .500 team next season. Whether or not they go above that will depend on if they change their top-heavy roster construction. As mentioned in the intro, I've made some pretty poor predictions in recent weeks on the league's middle-class teams. Consider this an exercise in self-accountability. And no, I'm not trying to reverse-jinx these teams to make my original predictions come true. As far as you know. - My Week 8 post featured the Bengals, and I argued that a breakout season from Andy Dalton made Cincy a top AFC contender. In the two games since, Dalton has promptly put up a combined minus-19.3 EPA and minus-0.51 WPA against the Dolphins and Ravens, two solid but certainly not immovable defenses. The Bengals are still heavy favorites to win the AFC North, but look at his game log and tell me what stretch looks like the outlier. - Three weeks ago, I argued that Cam Newton would have to carry the Panthers into the playoffs. Newton is having a decent season, but the defense is the story. After holding the 49ers to nine points, Carolina's defense moved up to third in Football Outsiders' DVOA metrics. They're a top-10 unit in both pass- and run-defense efficiency, with young front-seven studs and unexpected secondary contributors. In retrospect, a pretty heinous oversight. - Last week, I mocked the relatively quiet season the Cardinals were having. I stand by my criticism of Carson Palmer, who continues to throw interceptions as hideous as Arizona's black jerseys. But Andre Ellington has emerged as an offensive savior for this week's biggest risers, and check out their next five games: @JAX, vs IND, @PHI, vs STL and @TEN. Their last two games are at Seattle and home against San Francisco, so 5-4 Arizona probably needs four of those five games. But the playoffs are not out of the realm of imagination. Ironically, coming into the year, the Falcons had the fourth-best winning percentage in one-score games since the Ryan era began in 2007. Pythagorean models may well think that the Chiefs' aren't as good as their record, but I doubt that they consider Kansas City to be a league average team this year. I understand that the ratings are explicitly and deliberately set up to be independent of this sort of thinking, but it's still a little amusing to see Seattle at the top of the list, when the Seahawks' 5-1 in close games is a bit more of a reach than the Chiefs' 3-0. Hey Brian/Sterling, I'm pretty sure you forgot to account for the bye weeks when calculating the Opp GWP. It seems impossible for only 4 teams to have Opp GWPs at or above 500, and looking at past efficiency articles (Week 4 this year, Week 8 last year) they are both near 16. For instance, the Cowboys haven't had their bye yet, and when I do their SOS by hand I get 0.54, same as listed above. However when I caclulate the Bucs' SOS I get 0.57, but if I divide by N+1 instead of N I get 0.52, which is what's listed above. I'm going to check the others to see if that holds true. The difference between Seattle and KC is, Seattle has dominated some of their opponents in those close wins while KC has actually been out-played or played about even to it's oponents in their close wins in effenciency stats. The model too it on the chin last week and 2 wees ago with the Bengals. Very doubtful the Bengals were ever close to being the best team in the league. The best team is and has been Seahawks. This week the big game, the model has Denver -10.5 VS KC. The model has KC ranked to low. Doubtful that Cardinals, Giants, Cowboys and Bears are better than KC. Colts and Pats may not be as good either. The biggest difference between the model and the spread this week is Eagles -12 VS Redsins. Looking at GWP, Denver at .71 and KC at .49 is a .22 difference. Eagles at .68 with Redskins at .41 is a bigger difference at .27, yet Denver is a 9 pt favorite while Eagles only a 3.5 pt favorite. The model is telling you to back the Eagles this week. Very possible Eagles could have a regression this week, we'll see. Mitch, if you think the model is off on KC, what do you know about the team that the model doesn't? Technically, this is true, but I don't think the statement means as much as it sounds like it does. This late in the season, sure, the top 10 teams will likely finish in the top 10, because they've already done well on the first 60% of the exam. The better test would be to measure how many of the top/bottom 10 teams finish in the top/bottom ten over just weeks 11 to 16/17. My guess is that maybe only 5 or 6 would stay in the top/bottom ten.